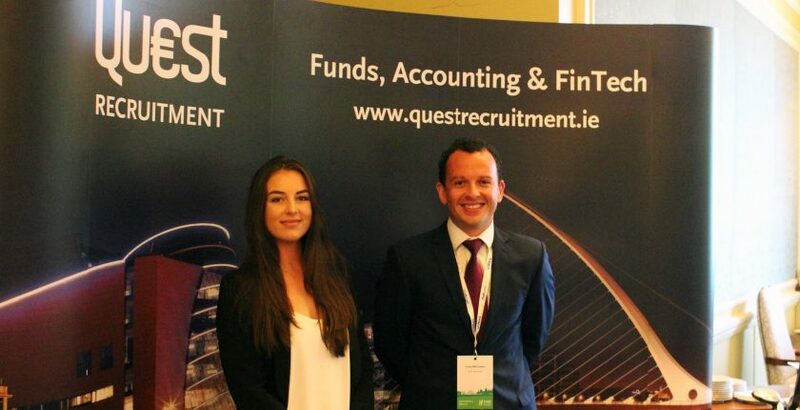 On Thursday 25th May, Quest Recruitment partnered as a sponsor and exhibitor at the Irish Funds Annual Global Funds Conference which took place at the Intercontinental Hotel, Ballsbridge, Dublin. Having previously attended the Symposium many times before as delegates, sponsors and exhibitors, we knew we would be treated to a day full of exemplary content and networking opportunities. The conference opened with a welcome address given by Tara Doyle, Matheson who outlined the many interesting panels and speakers that were scheduled for the day ahead. The theme of the conference was ‘’The Word Connected’’. This was a natural choice given that Ireland is a Global Technology hub of choice and has a leading role in FinTech. Shortly after, we were given an engaging talk by An Taoiseach, Enda Kenny. The room was glued to this talk as we were all reminded that Ireland is still the fastest growing economy for 4 years running and is perceived as a hub for financial services where growth and technology continues to arise. The Taoiseach also touched, naturally on Brexit, and the benefits gained by our European membership. An additional highlight from the day was the Securities Lending discussion moderated by Andrew Dyson – ISLA and included Panellists Craig Starble – eSecLending, Stephen Kiely – BNY Mellon, Maurice Leo – Deutsche Bank and Karl Bishti – Credit Suisse. This interesting talk discussed how Securities Lending plays an important role in liquidity and the importance of thorough and repeated engagement with a Securities Lender to outperform competitors in the industry. The panel also discussed ETF’s and the demand in Europe verses the demand in the US. However, there was a unanimous answer that the panel did not see the demand for ETF’s in the US as heavy as the demand for this in Europe. A topic that many people were keen to hear and discuss on the day was Brexit. This was moderated by Pete Townsend – Norio Ventures with Panellists including Dr. Vincent Power – A&L Goodbody, John McGrane – The British Irish Chamber of Commerce, Jeremy Soutter – Standard Life and Megan Greene, John Hancock – Asset Management. The Brexit Panel took a broad view across the industry which included perspectives on upcoming negotiations, dealing with uncertainty and the historical precedence of what may unfold. Positives that came from this talk was that is it not the worst crisis of the EU with 66% agreeing Ireland will be better off in 10 years after Brexit. An additional topic that generated huge interest included FinTech & Millennials. This was moderated by James Pomeroy – HSBC with panellists Brian Kennedy – Davy, Pervaiz Panjwani – Citi, Chris Horn – Atlantic Bridge & Bob Kneip – KNEIP. This evoked contemplative discussion whereby a question was put to the panel which asked how business can attract and keep millennials with comments flying between ‘’Millennials aren’t interested in assets. They want experiences’’ and how ‘’The generation gap will ultimately impact the value chain’’. The Panel then continued to explore the relationship of Millennials with the funds industry and the indisputable relevance of FinTech to its development. Overall this was a thought provoking, excellent day for all within the Funds Industry as we received great insights and fresh outlooks from the day. It was a pleasure to meet so many vibrant, informed individuals at the conference and we look forward to the next symposium at the end of the year.